The Rabbi with a Blog (Rabbi Jason Miller): Amar'e Stoudemire Thinks He's Jewish... So Is He? Amar'e Stoudemire Thinks He's Jewish... So Is He? The wedding of the century, starring Chelsea Clinton and Marc Mezvinsky last Saturday evening, has raised several significant issues for the American Jewish community. Should interfaith weddings with all the Jewish components (chuppah, ketubah, glass smashing, rabbi, and even the unnecessary tallit on the groom) be embraced or rejected? What message is sent when a rabbi co-officiates with a Christian minister? Should rabbis of any denomination perform weddings on Shabbat? But the question I have yet to hear has to do with Chelsea Clinton. After seeing the groom in a tallit and yarmulke, no one was questioning if he might leave his Judaism behind in this new marriage as Andrew Schiff (great-grandson of the philanthropist Jacob Schiff) did when he married Al and Tipper Gore's daughter Karenna in 1997. Before the wedding there was some talk on the Web about whether Chelsea might choose to convert to Judaism (which didn't happen), but never a of Marc Mezvinsky converting to Christianity. So, the question is: What if Chelsea now proclaims herself a Jewish woman without any formal conversion? There are people out there (the number is probably growing) who were not born into the Jewish faith and have not formally converted, but do consider themselves Jewish. Now, I know that halakhically (according to Jewish law), these individuals are not Jewish, but they can attend just about any synagogue in the world without their status as a "member of the tribe" being questioned. And even if it is questioned, a thorough background check is unlikely. I don't actually know if Chelsea will proclaim herself a Jew, but it would certainly make for interesting conversation. And that brings us back to NBA basketball star Amar'e Stoudemire. The newly signed member of the New York Knicks is still traveling through Israel in search of his Jewish roots. So, is he or isn't he? He's not Jewish, it's all getting blown a little bit out of proportion. His mother says there's some Jewish blood on her side, but Amar'e is just a total student of history and had been planning a trip to Israel for awhile. Is it possible [that he's Jewish]? Maybe. We're going to do some research, but I don't know where that will go. But that didn't end the buzz. Articles in the NY Times and Wall Street Journal both reported on his travels from Jerusalem to the Dead Sea and Eilat and then to Tel Aviv. Early Monday morning, Amar'e had a private shooting session with his personal coach at Nokia Arena with Maccabi Tel Aviv’s chairman of the board Shimon Mizrahi and team manager Gur Shelef observing his skills. Later that day, he met with former player Tal Brody and Mizrahi who invited him to return to Israel to play for Maccabi after his NBA career ends. Joshua Mitnick writes in the WSJ article: "Sitting poolside at the five-star InterContinental David hotel Monday amid an oppressive Middle Eastern heat wave, the NBA power forward's head was covered with a knitted white yarmulke, and his words were punctuated with Hebrew. The Jewish skullcap — most often associated with Orthodox Jews when worn outside a synagogue — is "to pay homage to God, Eloheem," he said. "It's like praying all day and showing your respect to the creator." After reading that I recalled a conversation I had with Amar'e back in 2003 (his rookie year with the Phoenix Suns) when I met him and teammate Joe Johnson at a moped rental location in Miami Beach. 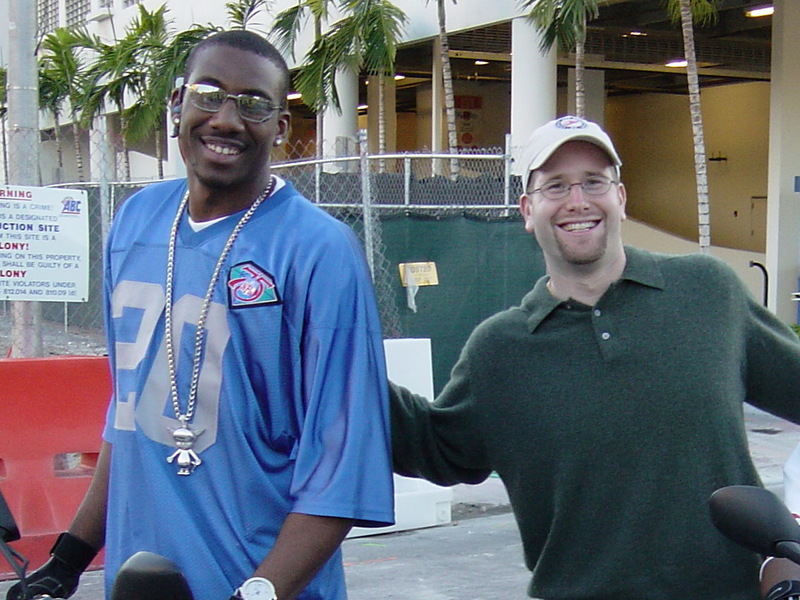 My dad and I wound up riding mopeds around South Beach with Stoudemire, Johnson and their friend. Amar'e asked what I did and I replied that I was a student training to become a rabbi. He told me that he's studied the Torah and that he knew a few Hebrew words. He didn't mention that he thought he was Jewish, but he showed me a Star of David tattoo that he had on his hand. 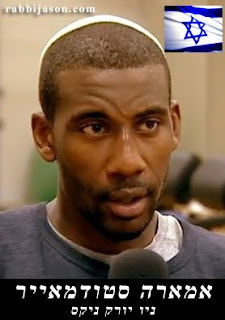 Perhaps the most insightful view into Stoudemire's motivation for coming to Israel and whether he considers himself Jewish is the face-to-face interview conducted by an Israel Sports 5 reporter following Amare's workout. Wearing a kippah, Stoudemire talks openly about his spirituality and how he'll observe Jewish customs in the future including celebrating Shabbat, fasting on Yom Kippur, and keeping Passover. The key point is that Stoudemire explains that Judaism to him is more about belief than actually being Jewish. He talks about his upbringing, love of Scripture study, and his visit to the Kotel (Western Wall) in Jerusalem. So, if Amar'e Stoudemire considers himself Jewish, will he be embraced by a segment of the Jewish community that doesn't care much of the technicality that he's not actually Jewish? Does it matter? Once again, you are spot on-- even prescient. it is clearly the question that we will soon be facing more and more for lots of reasons. Does the African American Jewish community (as in Beth El Temple Congregation in Philadelphia, for example) require an affirmation from the white Jewish community in order for them to be considered Jewish. Clearly, the 500 plus members of that community don't feel so. And I certainly am not going to stand in judgment over them or anyone else who wants to embrace our faith or community. Although a classic reformer, I believe it was R. Bernard Felsenthal who once said that a Jew is one who considers himself a Jew and is considered by others as such--or something like that. There is an example from Jewish history that may help provide guidance. The God Fearers were people in antiquity who saw themselves as being attached to the Jewish people to varying degrees, yet they never converted. They observed certain Jewish practices and accepted certain Jewish beliefs, but they never converted. Judaism welcomes supporters, wanna-be-Jews, you name it, but full acceptance into Judaism is through conversion. Amarie is already a Jew, he just don't know it. To be a Jew you have to be born one; negros, Hispanics, and native Americans are the real Jews. Of course he's Jewish. Who are we to judge? Relax with this crap. I am a jew and an ultra-orthodox man told me i was not. I didn't bother to tell him that my g grand father was an orthodox rabbi. Didn't waste my time on such a silly conversation. Torah indicated in Gen 10:1-5 that the Europeans are Gentiles, this includes Turk and Greeks and Persians whom the arabs are a mixture of without a shadow of a doubt. And Israel is NE Africa only separated by a man-made canal. And black skinned people are not Europeans or Arab, Turk, Persian, Greek (J haplogroup). So nobody black is a Gentile not even Hamites.. Only you guys are the gentiles. The Sefards are the above mixed Cananites, Spaniards, Romans.. And the Askanaz are Whites, Mongol and Turk Greek mixtures. And the Beduions and Afro Palestinians affirm who the read people from that land are. Its you guys who aren't the real Jews.. Omari looks just like an Afro Palestinian and so do black Americans..